Students cultivate their curiosities, explore their internal and external worlds, begin to work independently, and complete projects that require planning and organization. They build on previously learned skills and strategies, develop more complex social skills, and are able to think logically about and solve concrete problems. Every step prepares your child to continue to excel. 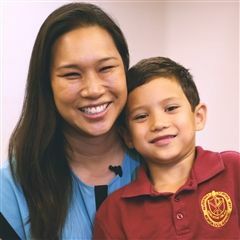 At Maryknoll, grades 1-5 represent an important time when students begin to work independently and in groups, tackle assignments that require planning and organization, and put their inner ‘detective’ to the test with critical thinking and problem solving in Project Lead the Way (PLTW) courses. Students can join our Grade School Robotics Team, which won the Amaze Award at the international VEX Worlds competition. Hands-on learning through science experiments and gardening deepens students’ understanding of the natural environment. Projects like Spartan Society let students express their inner entrepreneur. Students are exposed to a variety of creative arts, including music, dance and drawing. All students study Mandarin language. In grades 4 and 5, students can participate in athletics through the Christian School Athletic League (CSAL), through which they begin to learn and develop fundamental skills in sports such as basketball and volleyball. Ging Ging Liu Fernandez and her husband jumped at the opportunity to apply to the Chinese Immersion Program. Sisters Jacelyn and Jodie share a love for swimming but also pursue separate interests. Tell me more about Elementary School!